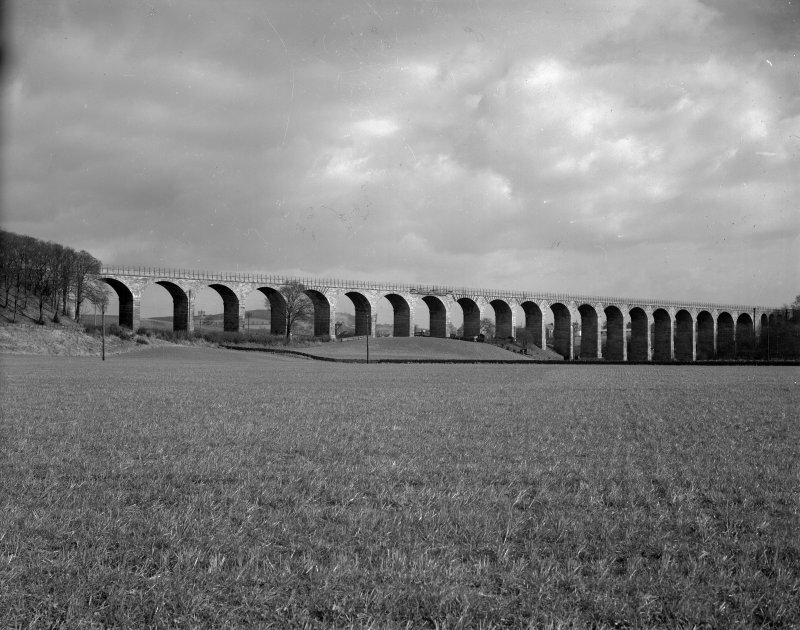 Oblique aerial view of Avon Viaduct, taken from the SE. 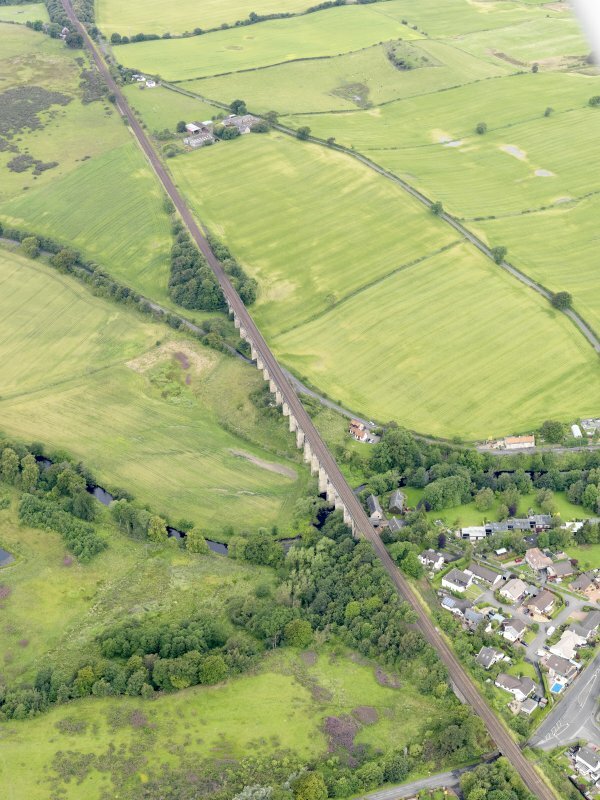 Oblique aerial view of Avon Viaduct, taken from the NE. 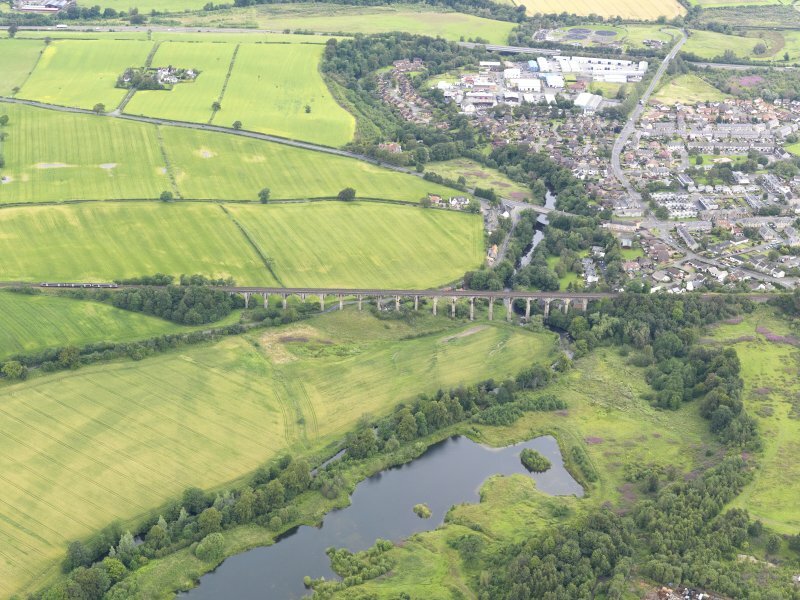 Oblique aerial view of Avon Viaduct, taken from the NNE. 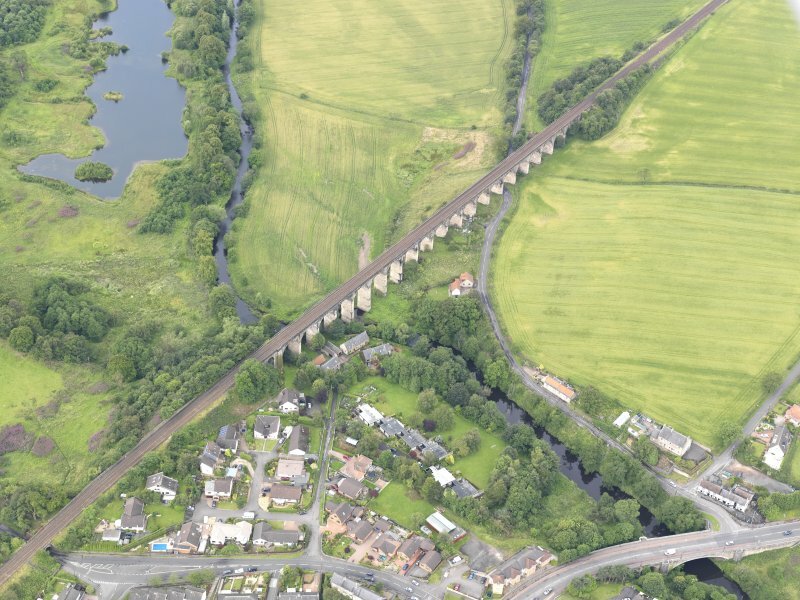 General oblique aerial view of Avon Viaduct, taken from the S.
General oblique aerial view of Avon Viaduct, taken from the SSW. The village of Linlithgow Bridge grew after the establishment, in 1786, of a calico-printing works, which soon employed 200 workmen. But its fortunes fluctuated, and scant trace survives. 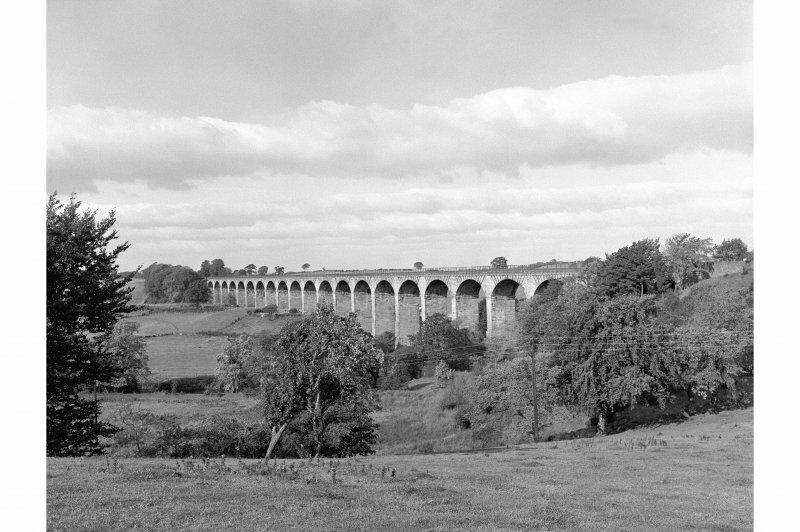 The bridge, completed in 1960, replaced one of 1660, built by Alexander, Earl of Linlithgow. 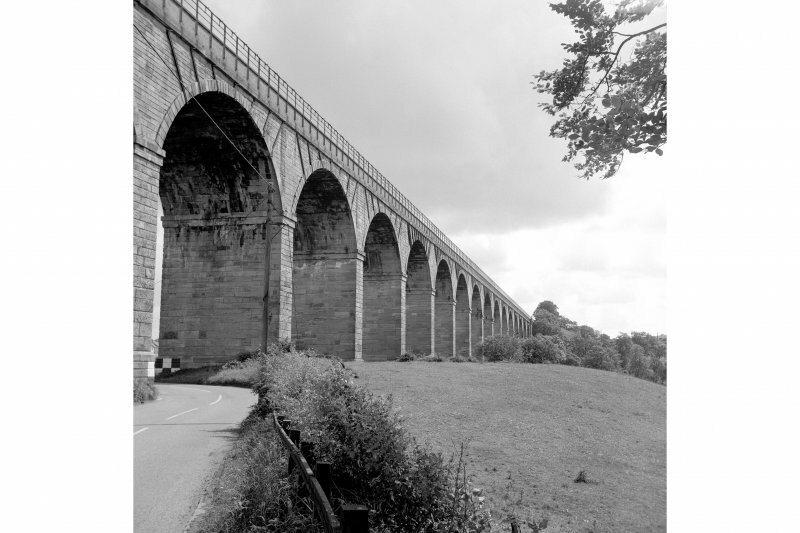 Overshadowing all is the magnificent railway viaduct, 1841, by John Miller, which strides across the Avon Valley, its 23 arches, some up to 90ft high, overshadowing the remains of the Manuel Nunnery. 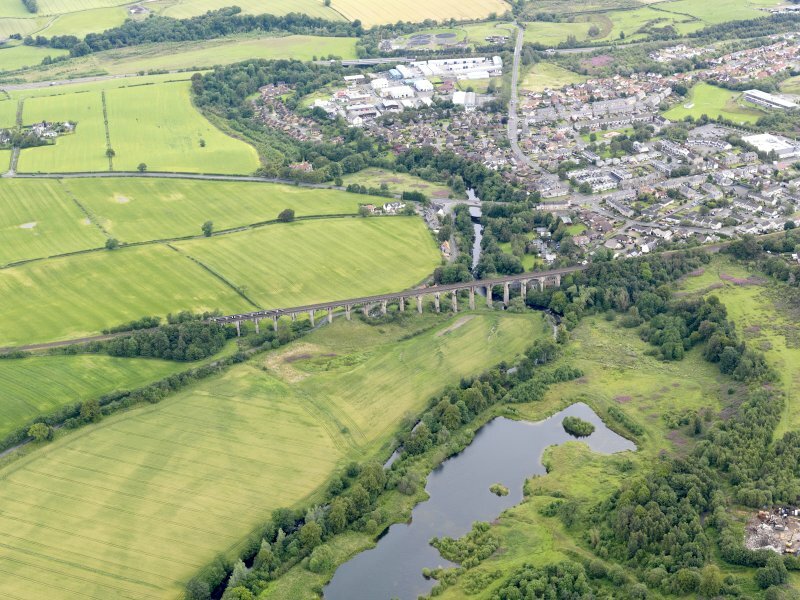 The Avon Viaduct which spans the valley of the Avon between Linlithgow and Manuel Stations, is an original feature of the Edinburgh and Glasgow Railway opened in 1842. 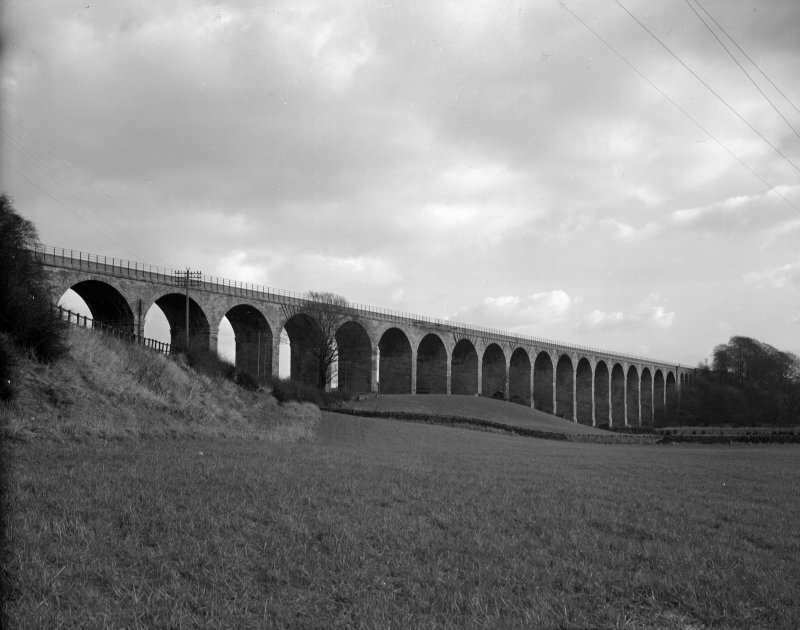 It is 442yds long and consists of a main arcade of twenty segmental arches each with a span of 50ft, with a subsidiary one containing three arches of 20ft span which rise from the sloping end of the E abutment. 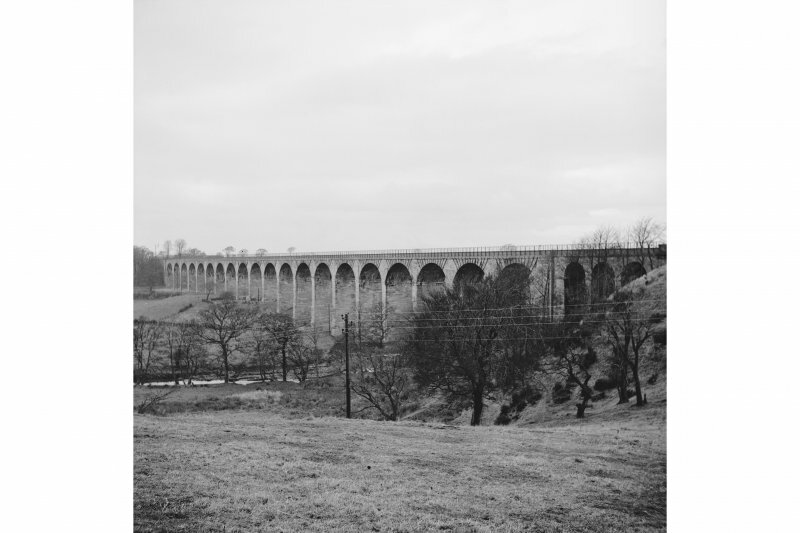 The river runs under the fourth and fifth arches from the E end of the main arcade, the springing-line being 66ft, the underside of the arches 82ft and the top of the masonry 92ft above the water level. The masonry of the piers is block-in-course, and they measure 28ft by 7ft above the intake that occurs just above the ground at the W end and is repeated throughout the arcade at the same level; the ends of the main arcade are emphasised by shallow buttresses applied to the westernmost pier and to the junction between the easternmost pier and the adjoining 20ft arch. 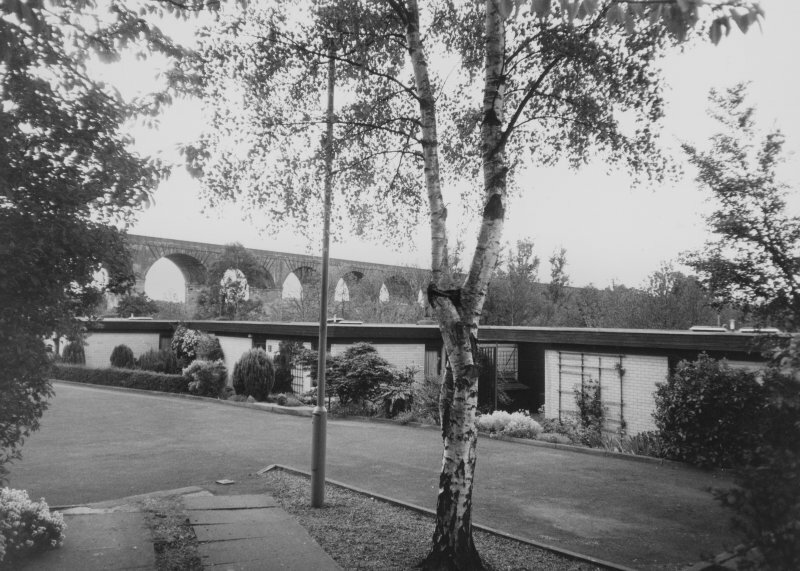 The piers have plain capitals, and a string-course runs from end to end at the wall-head; above this rises the brickwork that retains the road-bed and a heavy iron railing. RCAHMS 1963, visited 6 March 1953. 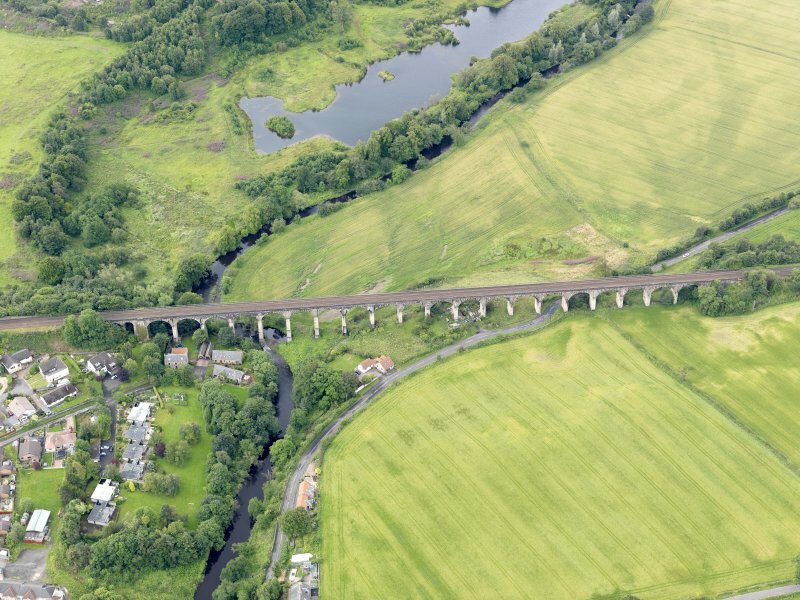 This lengthy and impressive viaduct caries the main ('Direct') railway line between Edinburgh and Glasgow (Queen St station) over the River Avon, which here defines the boundary between the parishes of Muiravonside (to the W) and Linlithgow (to the E). It remains in regular use by passenger traffic. The cited location refers to the midpoint of the structure. The available map evidence indicates that it extends from NS c. 97980 76989 to NS c. 98324 76918. 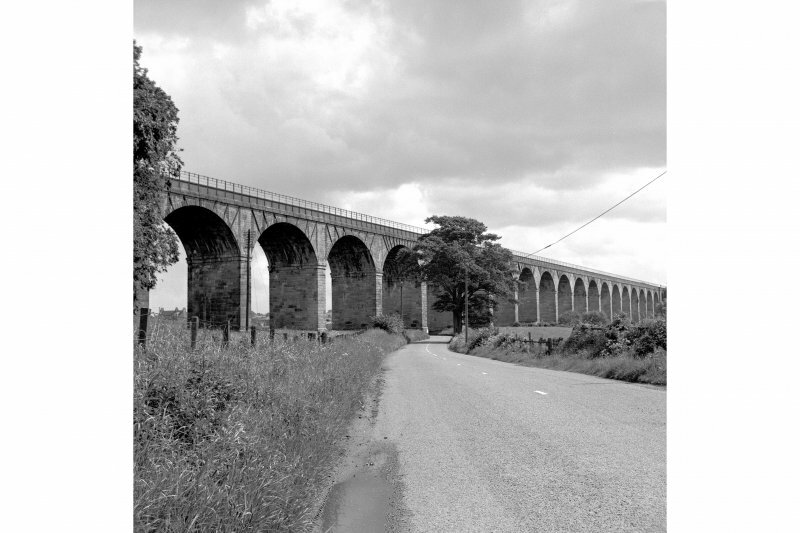 Information from RCAHMS (KD), September 2002.